To celebrate my birthday today, I thought I could mark the occasion by writing a blog about past presents I have received that carry that all important Blyton theme. I did a similar thing for my Christmas presents if you remember, so I hope you’re not too bored! Of course remembering ALL of my Blyton themed presents from the years would be a little difficult. In fact I am not entirely sure that I have received many Blyton themed presents before last year. I’m sorry that I can’t give you a story as cracking as Fiona’s Five go to Smuggler’s Top Birthday cake and her fabulous post about completing her Mr. Pink-Whistle series, but I hope you won’t mind my little stories so much! Time to get cracking with a few sentimental and well-remembered pieces of Blyton history that I have been given as presents. The first one that sprang to mind was an Enid Blyton Magazine that Anita, from the Enid Blyton Society Forums, sent me as a wonderful present last year for my 21st birthday. I have never been a huge collector of the Enid Blyton Magazines, so it was fabulous to finally have one in my possession and as I didn’t have any, there was no chance of it being a duplicate. I was extremely touched that Anita had sent me a birthday present and that it had been such a well thought out gift. 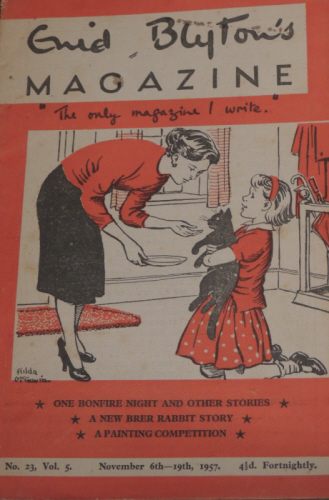 It has a lovely letter from Blyton herself in the front cover, serials of the Secret Seven and the Famous Five, as well as a Brer Rabbit Story and “One Bonfire Night”. It’s a lovely little magazine that is perfect for a light Blyton read. My first ever Enid Blyton Magazine. No. 23, Vol. 5. November 6th- 19th 1957. Also for my 21st birthday I received a simply smashing surprise. A 1st edition of Five on Kirrin Island Again from my parents. Its got a lovely vibrant cover showing the telescope the wrong way around. It’s in good condition, with hardly any foxing on the pages. I must admit, I haven’t read it yet, and it’s being kept in my special Blyton box where all the valuable stuff goes. I’m scared to handle it if I’m honest and scared of damaging such a wonderful book! Another 21st birthday present that I received was a wonderful hand crafted box from my lovely friend Fiona. She had been moaning about creating this for weeks and I remember her telling me that it had been sent off a few days before my birthday and she was worried that it wouldn’t make it to my house in time. However, it did and it’s a simply smashing box, although one of my first thoughts was “how many books has she destroyed to make this? !” – Sorry Fiona! It’s got two different books pasted to the wooden box and shredded pages inside (Five Go Off to Camp, and Five Go to Mystery Moor ). Also on the top it has a picture of my favourite chap, Julian, discovering Aily’s hiding place in Five Get Into a Fix. It’s simply SMASHING! My lovely Julian box from Fiona. This next present is one that I received only a few days ago for my 22nd Birthday (today as it happens and if you hadn’t worked that out already! ;)). My fabulous friend, Corinna – who recently moved back from the UK to New Zealand, where she is originally from, ordered me what she called a “joke” present. In fact, its has become something that makes me smile every time I look at it, but not because I see it as a joke, but as what I one day hope to achieve (I’m dreaming of a J.K Rowling/ Stephenie Meyer/ Suzanne Collins/ Enid Blyton type achievement) in regards to my fan fiction. I believe the idea between this present was spawned from a fan fiction that Corinna and I are penning together, despite the time difference. I must admit I genuinely fan girled when I opened this present. 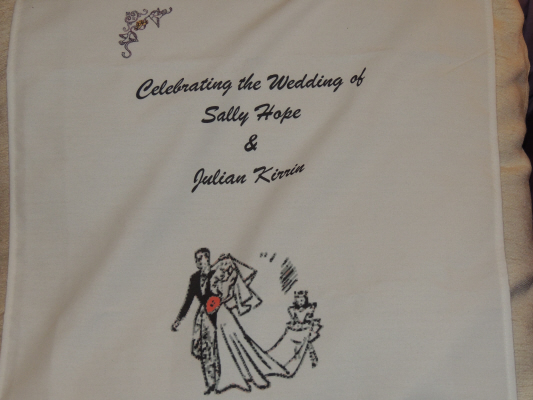 It is a wonderful tea towel commemorating the wedding of my two favourite characters, Julian Kirrin and Sally Hope (check the World of Blyton Index for the story so far!) I love this tea towel ever so much. I’m actually going to get it framed so that it won’t spoil or get lost or dirty. The tea towel I fangirled over, from Corinna. Julian and Sally for the win. I think all that I can say to these presents is that I have some awesome parents, and some truly special and amazing friends who know me so well as to treat me to such wonderful gifts. Thank you all! This entry was posted in Personal Experiences and tagged Birthdays, Enid Blyton Magazine, Five on Kirrin Island Again, Gifts. Bookmark the permalink. 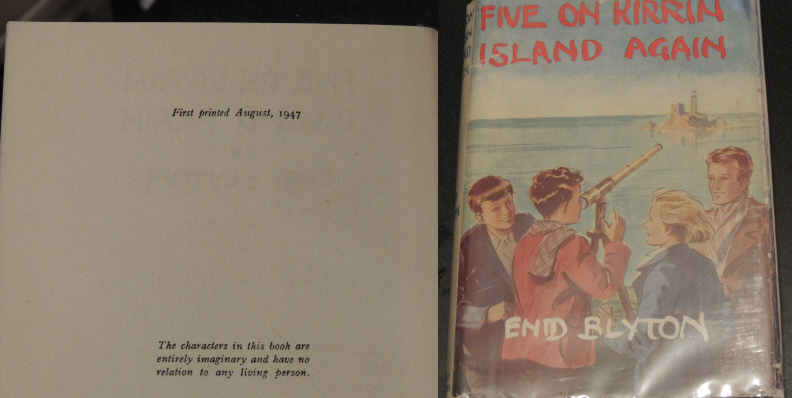 What lovely presents – especially ‘Five On Kirrin Island again’ with its famous dustwrapper mistake. No wonder you’ve put it into your Special Box! As for that celebration of Julian’s wedding – I am beginning to think it actually happened!